Notification No SO (SE-IV)7-2812018 government of the Punjab school education department has issued on 19-09-2018 about transfer cases Punjab School Teachers under transfer policy 2013. 3. 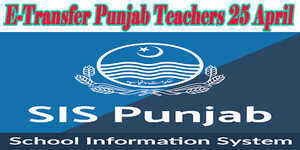 All Deputy Commissioners / Administrators, District Education Authorities in Punjab. SUBJECT: TRANSFER CASES OF DIVORCED, WIDOWS, DISABLED TEACHERS AND MUTUAL TRANSFERS UNDER TRANSFER POLICY 2013. It is directed to refer to the subject cited above. i) As one time dispensation during entire service, divorced and widow teachers may be transferred against vacancy during ban and before completing three years tenure in the present school. 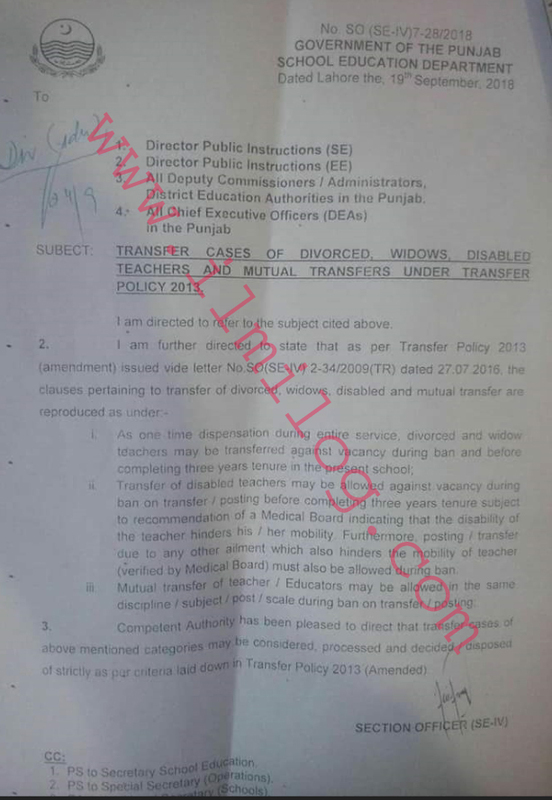 ii) Transfer of disabled teachers may be allowed against vacancy during the ban on transfer posting before completing three years tenure subject to the recommendation of a Medical Board indicating that the disability of a teacher hinders his/ her mobility. Furthermore, posting transfer due to any other ailment which also hinders the mobility of teacher (verified by Medical Board) must also be allowed during the ban. iii) Mutual transfer of teacher or Educators may be allowed in the same discipline /subject/ post or scale during a ban on transfer posting. The competent authority has been pleased to direct that transfer cases of above-mentioned categories may be considered/ processed and decide under transfer policy 2013.